For more than 15 years, and with more than 2,000 people, we’ve taught spoon carving on this farm as a method for bringing different people together and for accessing creativity. 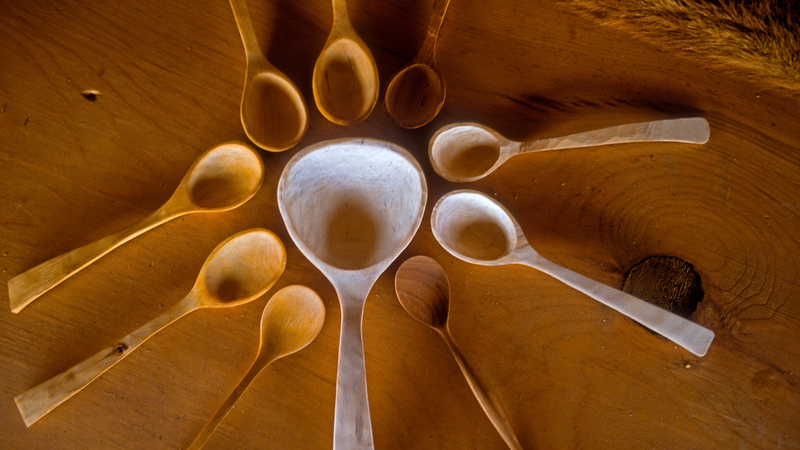 Spoon carving, for us, has always been an important act of community building. Please join us on this full moon weekend for a creative time of using your hands and minds to carve a spoon from green wood. All skill levels are welcome. We will teach you how to carve a beautiful spoon using 3 traditional tools: a crooked knife, a straight knife and a draw knife. We’ll start with a block of white birch or cherry and end with a beautiful and useful spoon that should last a life time. And we’ll cover the philosophy and the practice that’s needed for all the steps along the way. Group size is limited to 12 (register early) to ensure everyone gets attention and can move through the process at their own pace and return home with skills they can continue to use. We’ll take breaks to discuss wood, tools, spoons, yurts, the full moon, or whatever else comes to mind. You can expect an unusual and inspiring weekend that gives you important skills, teaches you how to make a spoon, and leaves you wanting and able to create more things. The symbolism of carving your own wooden spoon is similar to the symbolism of Gandhi asking his people to weave their own cloth. Taking a specific action to do something reminds and encourages us of the greater things we can do. It’s valuable to the experience to share meals together, so the price of $140.00 per person includes wood, tools, instruction and 3 meals (lunch, dinner, breakfast) at the farm. If you choose to stay over at the Refuge at Knoll Farm, please add an additional $65.00. Lunch, dinner and breakfast together to share experiences and learning. We’re really excited and hope you can come! Once you have completed this form you will be directed to PayPal to pay a $100 deposit to hold your spot.